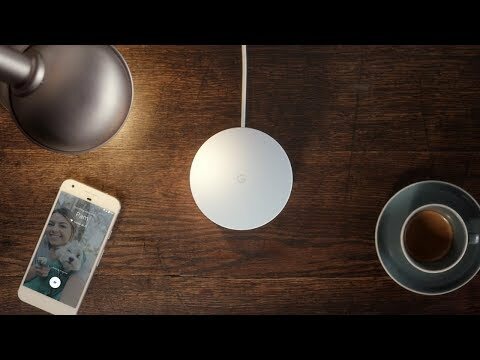 Google Wifi delivers an optimized, smart connection that doesn't require you to be a network geek - the Google Wifi system takes care of everything for you. This 3 pack of the Google Wifi will gives you a comprehensive network, with three Wifi nodes that you can connect to throughout your home. The Google Wifi 3 pack is ideal for anyone living in a larger home struggling with Wifi dead spots or who simply has too many devices under their roof trying to connect to the same network. It's also a great upgrade for anybody dissatisfied with classic repeater systems - the Google Wifi mesh network delivers consistent coverage throughout your entire home. Existing Chromecast or Google Home users also stand to benefit - the Google Wifi device has been optimized to work with these products. Leave it to the expert: You don't need to spend hours messing around in your router's settings menu to get a quick connection. 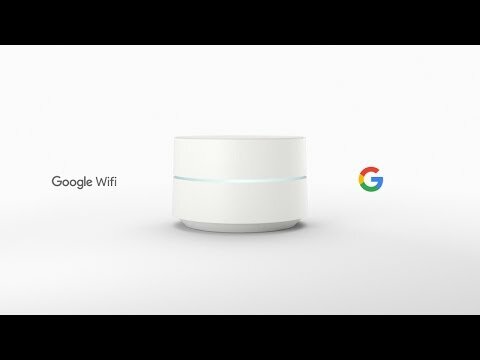 The Google Wifi system switches your device automatically between the 2.4 and 5 GHz bands, while also connecting you to the least congested channel on the network. Chop and change: Weighing in at less than a pound and fitting in the palm of your hand, it's simple to move the Google Wifi devices throughout your home. You don't even need to worry about an Ethernet port - the 2nd and 3rd modules only require a connection to power. All the speed you need: The Google Wifi (Triple Pack) is also your gaming router and streaming router thanks to device prioritization! You can prioritize your Google Chromecast to stream the last 4K content over Netflix or give your gaming PC priority to give you enough bandwidth for your 100-player battle royale. The family-friendly router: Google has designed a Wifi system that has family life in mind. You can schedule Wi-Fi breaks on your children's phones and laptops that prevents them going online - perfect for homework time and the dinner table. Also available are classic website and app blocking. Control your network: The Google Wifi App lets you see which devices are connected and how much bandwidth they're using, giving you a powerful way of freeing up the network for other devices. You can also run network speed tests or set up a guest network for your friends and family. Solutions for all sizes: Interested in the Google Home but think that 3 devices is too many for your home? Also available at tink are single devices (for apartments) and 2-device packs (for medium-sized homes). The Google Wifi (3 Pack) can cover an area of between 3000-4500 square feet with a quick connection. It builds a mesh network which delivers a far more consistent network when compared with extenders or repeaters. You'll get 3 Wifi nodes which you can rely on for all your browsing, gaming and streaming needs. Plug the first module into power and connect it to your router. Then download the Google Wifi app and follow the instructions on screen for placing the other routers. Easy as can be. A minimalist design, with a blue LED ring that contrasts nicely with the Google Wifi's white frame. It has a lightweight and compact that's been designed for portability. The app gives you comprehensive information about your network, including the devices currently connected to your network and the bandwidth they're using. It also helps you in finding the correct placement for your Google Wifi nodes. Triple pack of the Google Wifi designed for larger homes between 3000-4500 square feet. It automatically optimizes your network giving you the best connection possible. Delivers a strong connection on all 3 nodes, with device prioritization delivering a reliable boost when you need extra bandwidth for gaming or 4K streaming. Only supports WPA2 login in order to provide the most security possible. All communication between server and device protected by TLS. Automatic firewall updates. Great for large homes with multiple devices all trying to connect to the same network. Also great for customers who've found that traditional repeater systems just don't do enough to meet their needs. With the Google Wifi App you can check which devices are connected, run a speed test, fix bugs quickly and set up a guest network. What are the Google Wifi (3 Pack)'s system requirements? Can I use the Google Wifi as an extender for my existing router? No, the first module of the Google Wifi system assumes the role of your router. The 3 modules can't thus be used as simple extenders with your existing router. To see which devices are connected to your network, go to the 'Network' tab in the Google Wifi App. Here you'll be able to see which devices are connected to the network, as well as the current amount of bandwidth each device is consuming.